Hours: 9:00 – 6:00 for gardens. With over 1,000 acres of space, Longwood Gardens is one of the largest and most beloved botanical gardens in America. Located near the border between Pennsylvania and Delaware, over 4,600 types of plants and trees fill the grounds. The gardens were started by Samuel and Joshua Peirce in 1798, and was purchased by Pierre S. du Pont, a member of the extremely wealthy du Pont family, when they came under threat in 1906. He changed the place from an arboretum to the gardens seen today. It remains one of the Delaware Valley’s most popular attractions, with over one million annual visitors. Longwood’s main fountain is a beautiful sight, with its Greco-Roman design. It was refurbished between 2014 and 2017, with new fountains, the tallest of which reaches 175 feet. The design of this garden was inspired by Italian architecture, although the gardens are inspired by those of France. The fountains themselves are majestic, something that can easily be watched for extensive time periods. Behind the main fountain is the Chimes Tower, a small, round Gothic bell tower with bells audible from the conservatory. 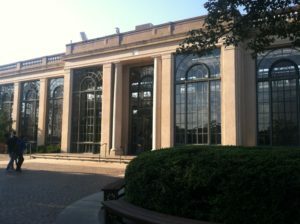 The massive conservatory is one of the most prominent parts of Longwood Gardens, with over 4,000 plant species inside. It is a majestic glass structure, which has large glass windows that allow plenty of light into the conservatory. It has several large halls, including the East Conservatory, the Children’s Garden, and the rose and orchid houses. Another notable feature is the Bonsai trees, many of which are centuries old. Outside, there is a pond with very large lilypads, and a plam house next to it. In the back of the building is a ballroom that has a well-painted ceiling and a pipe organ with over 10,000 pipes. As ridiculous as it may seem, the award-winning restrooms are among the most notable features, as the wall in the hallway leading to them is covered in a massive green wall, which has 47,000 plants and was the largest in the world upon its completion. The mansion of Pierce-du Pont still stands on the grounds and is open to visitors. 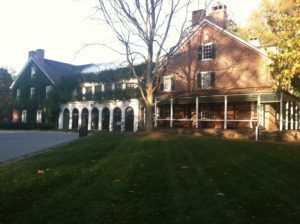 Originally built around 1730, it was purchased by du Pont in 1906, where he spent his weekends. It is now an indoor garden, with a conservatory inside. The house is also home to the Longwood Heritage exhibit, which is a collection of photos and objects relating to the history of Longwood Gardens and the du Pont family. Other highlights include the Open Air Theater, where there are routine showings of the excellently choreographed fountains. There are several treehouses, including the Canopy Cathedral Treehouse and the Birdhouse Treehouse. There’s the Italian Water Garden, where visitors can see a series of fountains from an elevated standpoint. Also, there is a forest, with a set of trails going through it. Behind the gardens is the expansive Meadow Garden, a vast series of open fields, with a lake, a treehouse, and several other features. Around Christmas, Longwood Gardens are festively lit, with thousands of lights decorating the conservatory. Needless to say, Christmas trees are abundant here, and they are excellently decorated. The fountains are active at this time, accompanied by Christmas music, and concerts at the organ. This is possibly the best time to go to Longwood, but it is also the busiest. During this time, it is best to go at night. The sun sets earlier, making this easier. Admission is $23 for adults, $20 for seniors (62+), $12 for students (5-18 or ID), and free for children 4 and under. During peak days, around Christmas, it is $30 for adults, $24 for seniors, and $13 for students. It is highly recommended that you purchase your tickets ahead of time, especially during peak days. DIRECTIONS FROM CENTER CITY: Get on the Vine Street Expressway and head east until you get to I-95. Begin going south on I-95. Follow I-95 until you reach Route 322, south of Chester, PA. Continue down 322 until you reach Baltimore Pike, which connects Philadelphia and Baltimore. This road is also known as Route 1. 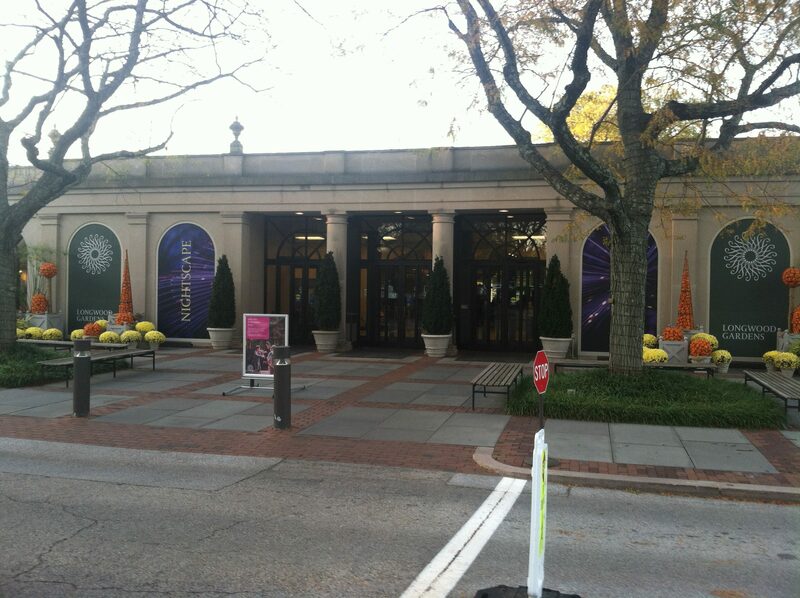 Follow this until you reach Longwood Road, with a massive sign for Longwood Gardens. This drive should take around one hour.